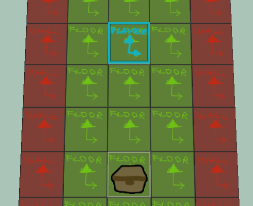 While running the game today, I noticed that I occasionally got a room or two that were rotated incorrectly. These were always rooms with 3 and sometimes 2 connections. Meanwhile, all the other rooms were always fine. I started tracking down the reason, but it was hard to reproduce reliably, since the entire dungeon is random. 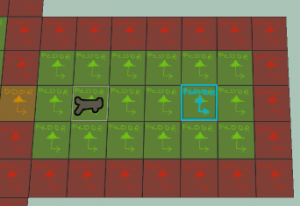 Skip a few hours later and I realized this was an error in determining how much to rotate a room template based off the comparison between desired and actual room directions. Okay so, the actual bug was that directions Up, Right, Left were sorted in that order, when in actuality I needed Left, Up, Right, because I am not just looking for the 3 consecutive directions, but also that they have the same “gap”. Same bug with Up, Left. 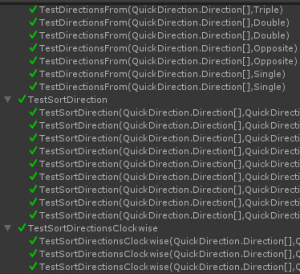 In the end, I wrote a bunch of unit tests for my newly-made direction and rotation utility library. Items now have entities, definitions, world objects, sprites, links between all that and their collections in the world. 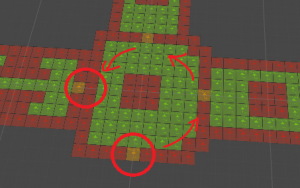 I glossed over these details with other things – mobs and tiles, but they have the same data-definition-view logic. It’s all very independent, encapsulated and structured. Impressive! In all seriousness, I will need to have a much more time-consuming polish pass to actually drop and pick up items smoothly with animation and all sorts of flair. The transitions happens seamlessly between the two props, so I don’t need to complicate prop logic (yet) with being able to transform them and such. 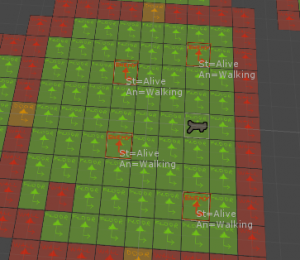 If I ever need to transfer stuff like health between props (or any other property between mobs or items or whatever), I can do so manually while keeping the main logic cleaner. 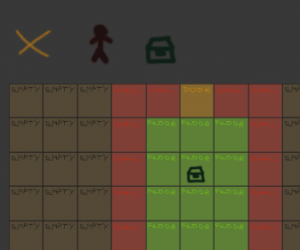 Later, I will work on the random loot and mob generation and placement in rooms. But I need to get actual combat going followed by actual enemy AI followed by MMO RTS elements. In other words, I need to start playing the game before I build more systems for it. I don’t really have the luxury to rewrite and redesign large parts of the game, so I need to test and get them right asap and not accidentally proceed into a dead end.